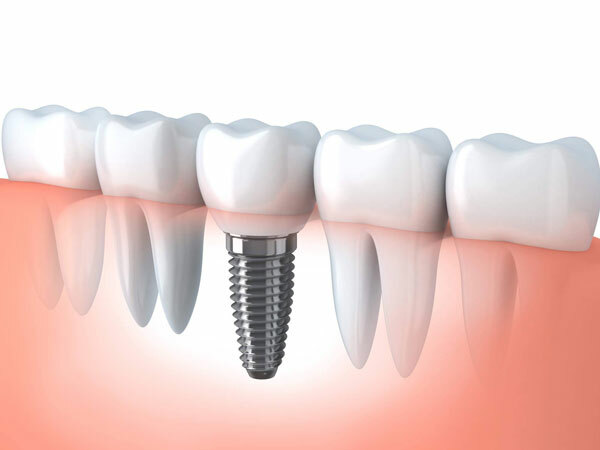 Dental Implants are a modern and advanced way of replacing a missing tooth, teeth or for replacing traditional dentures. A dental implant is a metal rod made from Titanium which is placed into the jawbone to replace the root portion of your own natural tooth. Titanium is a material well suited and compatible with bone and bone tissue. The implant is used to support a crown, bridge or denture. The primary aim when placing implants into the jawbone is to ensure that the surface of the titanium implant fuses together with the surrounding bone tissue, in order that it creates a strong stable support for new teeth. A free consultation with our specialist implant dentist is required, during which a plan and a diagnosis is drawn up, so we can talk you through your options. Our implant specialist works with many complex implant cases including extensive bone graft procedures and delicate sinus lifts. The procedure can really change the way you feel about your teeth and mouth and make a remarkable difference to the overall look and feel. A free consultation with our specialist implant dentist is required, during which a plan and a diagnosis is drawn up, so we can talk you through your options. Our implant specialist works with many complex implant cases including extensive bone graft procedures and delicate sinus lifts. The procedure can really change the way you feel about your teeth and mouth and make a remarkable difference to the overall look and feel.